« Happy Chinese New Year of the Horse! 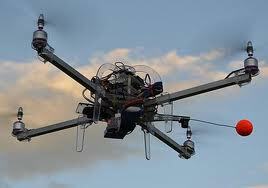 If you live in Australia, watch out for umanned aerial vehicles (UAVs) when you’re out in the open. My girlfriend and I encountered one last Saturday at Boulder Beach, a little-known beach north of Ballina in New South Wales. This beach is something of an oddity; it’s very different from the sandy beaches of the rest of northern NSW. 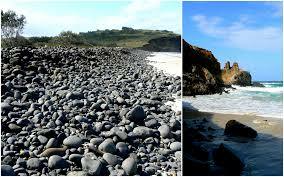 It’s literally covered in small boulders, washed smooth by the sea. It was lunchtime, we spread out a blanket and had a picnic under a breadfruit tree. After we’d eaten, we went out some 300 metres to paddle in the rock pools left behind at low tide. It was a beautiful day, hardly a cloud in the sky. As we were rolling up our jeans to wade a bit in one of the larger pools, we heard a sound that didn’t fit in this idyllic seascape. A mechanical sound. Into our line of vision came buzzing an unmanned quadcopter about three feet in diameter, all black metal, flying at a height of around 30 feet. Unnoticed by us, some guy in a van had pulled up onshore and launched this UAV, which he kept in our vicinity, the red light of its camera pointing at us. He had the entire empty beach to fly it in but he kept it near us. It seemed to be a deliberate provocation. We suspected we were being photographed so we didn’t react. If I’d had a slingshot I might’ve brought it down, but slingshots are illegal in Australia, while anyone can buy a UAV and you don’t need a licence to fly one. There’s so much concern about the increasing use of these drone UAVs the Australian government recently convened a special senate commitee hearing on the subject. The upshot of it was that at present there are no privacy laws in Australia covering the operation of drones in open spaces; only safety concerns can legally be addressed. The Australian Civil Aviation Authority CASA’s ruling is that a UAV must never be closer than 90 feet to any member of the public. This guy’s was around 30 feet. After five minutes of so we tired of this passive aggression and began to return to shore. The operator brought the drone back in. Although he was standing one metre away from where we’d left our picnic blanket and gear — an unusual thing in itself to do when he had the whole beach to choose from — he never spoke to us when we returned, never made eye contact, though he kept the front of the landed drone facing us and its red camera light remained on. What do you do in a situation like that? You have no legal rights. If you attack him or damage his drone (the high-end ones can cost well over a thousand dolars), you’ll be the one who ends up in court. If I’d known at the time about the CASA ruling of 90 feet, I might’ve spoken to him; then again, I might not have – I try to steer clear of loonies, especially ones I don’t know and whose behaviour I can’t predict. I wondered if he had a little online site tucked away somewhere where he put up footage of the women he’d aggressed, or was it just a private kick? This middleaged guy with glasses didn’t look to me as if he’d be game to fly it over any men, unless perhaps they were on crutches. Using the rego number of his van, I found he’d registered with a UAV site in the US on 17 December 2012, so I’m sure we’re not the first women he’s pestered. The moral of this story is: next time you’re out in the open in Australia and think you’re alone, think again. Some passive-aggresive stalker three hundred metres distant could be sending a drone your way. That’s a horrible invasion of privacy. And the worst of it is, anyone get do it! I would’ve lobbed a few rocks at the thing. Strangely enough, Louise, where we were, 300 metres out, the rocks were all fused together; it looked like the result of some kind of volcanic activity. I probably would’ve missed, anyway. I haven’t honed my aim lately..
Well, Damn! There goes that plan. It’s a good thing you had a girlfriend with you! Great that you got his number plate. Better still that you were able to use it to find information about him. Have you given the information to the police? If there’s no recourse via the law how about a name and shame site? As you say, you’re probably not the first people to be harassed by him and the likes of him. By now there’s probably a site to expose such jerks. Oh, and Louise, that’s exactly what I might have done too, but beware, missing and hitting someone/thing else might not have been a problem on that occasion and in that place, but one really does need to be sure of one’s aim and 100% certain of hitting the target. And even if you do hit the target, what then, if there are people in the general area: will hitting it cause it to lurch out of control and crash into someone/thing? God-damn annoying that people get away with stuff like this but we can beat them if we put our minds to it. Another whole new areas for lawmakers and lawyers. Here in the US, a drone crashed near a school quite recently. As I say, Paul, not a pick-upable rock in sight where we were 300 metres out – a variation on the old ‘Water water everywhere, and not a drop to drink’. This was ‘Rocks rocks everywhere and not a rock to throw.’ It’s probably just as well. . The government will have to do something pretty soon over here in Australia. But exactly what, no one quite seems to know. Making registration of these things compulsory would be a start. At present, anyone can buy and fly one without registering it anywhere. o for a few well placed tennis balls and a friend filming,the result: a great viral you tube clip.